As a busy summer slips quietly into an exciting autumn, it is once again my pleasure to introduce this latest ‘food filled’ edition of the AIM magazine. Over the summer I have personally enjoyed a very special family celebration, one which has reinforced to me that there is indeed no greater pleasure in life that to able to sit down and share a leisurely meal with family and good friends and it seems that the highly talented members of AIM agree! 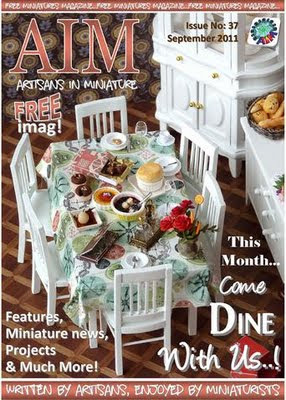 This month AIM members have collectively chosen to focus on our theme: ‘Come dine with us..!’ and together they have filled the pages of this very special September issue with a stunning celebration of entertaining ‘in miniature’. The pages of this new issue are crammed full of inspiration and ideas for the international miniature diner! So whether you are planning to create a realistic dining setting in your dolls house or you simply want to bring a kitchen scene to life with stunning, mouth watering food; look no further we have it all! This new September edition of the ground breaking AIM magazine is also awash with many fabulous free projects for you to try your hand at, from printable plates (in three scales) on pages 16 and 47 to creating a stunningly realistic salad without the use of clay on page 52! 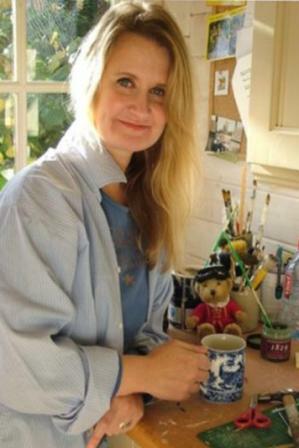 In short there is something for every miniaturist to try! So as you enjoy the last of the summer sunshine, why not put your feet up and come dine with us! click on the cover to read the latest issue! Muchísimas gracias por esta maravilla de revista. ¡Es genial!